Here at donnayoung.org you will find lesson plans for some of the courses that are published by Apologia Educational Ministries. We used the original four books (first edition) Exploring Creation With General Science, Exploring Creation With Physical Science, Exploring Creation With Biology, and Exploring Creation With Chemistry. My children enjoyed the books and that is why this part of my web site exists and that is why I have posted my lesson plans. I do not have a lesson plan for every book or edition. If I do not have what you need, look at the co-op page. A co-op schedule could serve as a basis for a class schedule. The Co-op schedules do not require a subscription. The Apologia Files made by Donna Young are included with Basic and YoungMinds. Lab WU requires an active subscription to YoungMinds. 1. Do you have "said" schedule? If I do not have it I will answer, "No, but have you looked at the co-op schedules?" 2. Do you know where I can find "said" schedule? I will reply no to this question because I do not know. 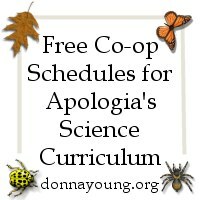 Apologia Science Co-op Schedules: Several homeschoolers have generously donated their co-op schedules to be used by other homeschoolers at their science co-ops. The books in the elementary series, named the "The Young Explorer Series," are written by Jeannie Fulbright. The books are for children who are ages of six through twelve. I do not have schedules for those books and I explain why at Elementary Series. I have planners for the books at TOC Planners. I've made a Toc Planner for each of the six books (as of autumn 2010). Exploring Creation with Botany "What Do You Remember"
I've made a lot of resources for this book and I have written about it as well. Others have donated resources. The first page is the "General Science Home Page" and the rest of the pages are linked below. Exploring Creation with Physical Science was the first book that we used. We really enjoyed both the book and the experiments. I think our enjoyment shows in my first edition original schedule. My other schedules are more refined I suppose. Below are the links to my resources for Exploring Creation with Physical Science. Exploring Creation with Biology has so much vocabulary that I was inspired to make vocabulary bookmarks to be used as a study aid by my children. I put the bookmarks online and they became widely used by other homeschooled students. I was very busy during the year that we used this book and the years beyond, and as a result, I do not have many resources for this book, but I do have the important ones, the bookmarks and a schedule or two. I have a link named More Biology in the menu. There are a few resources on that page for these two books: "The Human Body: Fearfully and Wonderfully Made!" and "Marine Biology." What I have on those pages is all that I have other than co-op schedules. There is a co-op schedule for both "The Human Body: Fearfully and Wonderfully Made!" and "Marine Biology." I was incredibly busy both times that we used the chemistry book. I made a basic checklist instead of a schedule and I made bookmarks. Please check the co-op page for schedules for the second edition book. In this part of my website, Apologia Science Resources, each book other than chemistry has its own set of lab forms. I will link them below. Lab WU requires an active YoungMinds subscription. Note: If possible, use a sewn composition books instead of the printable forms. You must obtain my permission before creating derivative work from my files in the apologia section if you intend to share the derivative work with others who are not your students. Curriculum Fair Class Instructors: You have my permission to distribute free printed copies of the schedules that say by Donna Young as long my copyright and/or author information remains visible on the schedules. Please note that I am not employed by Apologia Educational Ministries. I do not have information about becoming a vendor.